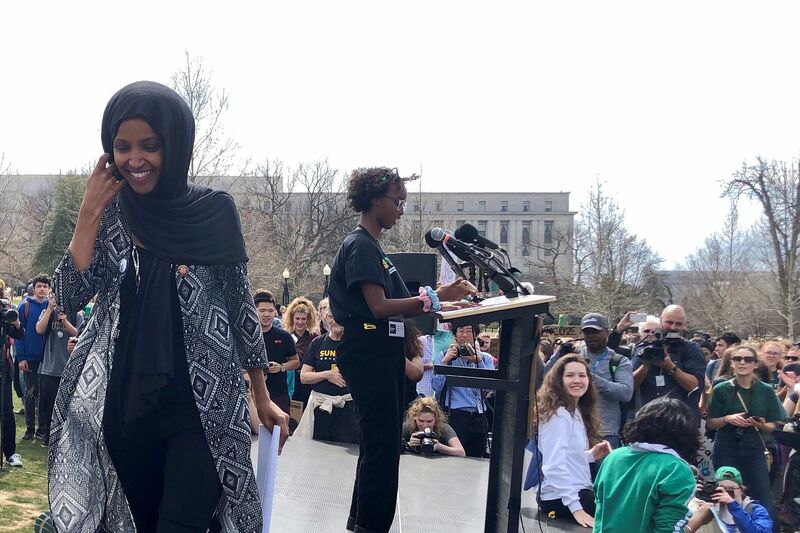 Rep. Ilhan Omar (left) leaves the stage after introducing her daughter, Isra Hirsi, 16, one of the national organizers of last Friday's national Youth Climate Strike. Phillips felt he had to address what had been unspoken for nearly two hours — the recent divisive remarks of Rep. Ilhan Omar, a Muslim who suggested American supporters of Israel have an "allegiance to a foreign country." Those kinds of remarks, Phillips said, represented "tips of the arrow" — small but devastating offenses that made Jews fearful of a rising tide of anti-Semitism. Phillips told his fellow Minnesota freshman that she had to apologize and said the group should publicly affirm Israel's right to exist and protect itself. His words stunned the three Muslim Democrats in the room, as well as some other Jewish members and third-party participants. Rep. Rashida Tlaib, Mich., a Palestinian American who does not support the existence of a Jewish-only state, grew emotional and started to cry as she spoke of her grandmother's suffering in the West Bank at the hands of Israelis. "She would treat you like a grandson," she said to Phillips, according to two people in the room. The second gathering aimed at reconciliation broke on a bitter note. The abrupt end to the March 5 meeting was a discomfiting moment in a previously unreported, behind-the-scenes effort inside the diverse class of House Democrats to foster tolerance amid the withering pressure of Washington. Democrats' convulsive efforts to respond to recent Omar criticisms of Israel have exposed ugly rifts in the party over religion and U.S. ally Israel that have boiled over on Twitter and in the public sphere. Those interparty fights have distracted from the party's legislative agenda and fueled political attacks from Republicans, including President Trump. It's why Democrats on both sideshave formed a small group to try to work past their differences. Success or failure of the private meetings could have an impact on the party's larger effort to unite across schisms on race, gender and ideology. Despite the harsh endingto the meeting, several participants who spoke on the condition of anonymity to discuss the private conversations said the huddle had a profound effect: Some in the room heard stories of hardship from their colleagues they knew nothing about. The next day, at a heated closed-door caucus meeting, some of those attendees pushed back against leadership's plan to reprimand Omar for the same comments Phillips objected to the night before. Some Jewish participants of the meeting broke with people of their own faith who wanted to rebuke Omar by name. They had come to know her, did not believe her comments were intentional and objected to the idea of rebuking a woman who told them the night before about death threats she'd received. "If we can't be on the same page, it's hard for the country to," said Phillips, adding that he learned from the gathering — and the effect his words had. "We have an opportunity here because the eyes are on us. We know that." The push to bring lawmakers from different backgrounds together began earlier this year, spearheaded by Rep. Jamie Raskin, Md. — an ex-professor and veteran in activist circles who organized a makeshift gathering over Chinese food. Days before the first meeting on Feb. 13, Omar posted tweets attributing politicians' support of Israel to campaign money donated by pro-Israel groups — "it's all about the benjamins baby," she wrote. Critics earlier had unearthed comments Omar made during violence between Israelis and Palestinians in 2012, suggesting Israel had "hypnotized" a world that did nothing to stop the bloodshed. Those comments outraged many Jewish Democratic lawmakers, who pushed House Speaker Nancy Pelosi (Calif.) and her lieutenants to condemn Omar's remarks. Omar apologized the next day and later deleted the tweets. When the group met two days later at a former lawmaker's house on Capitol Hill, the controversy had mostly cleared, and Raskin was determined to keep the mood casual, according to several who attended who spoke on the condition of anonymity to discuss the private sessions. The idea, according to people familiar with the session, was to humanize each other. Raskin would not discuss details of the meeting but said that he is "constantly trying to get members together to talk about the experiences and values that have brought them into public life." "I think it was just the beginning, and I think it's important that we get to understand each other and try and educate people, understand people's different points of view," Lowey said about the meeting. But the conversations left some members wanting to delve deeper into personal struggles- especially in light of Omar's comments. Rep. Andy Levin (Mich.), a former labor organizer and synagogue president, began organizing a more formal event that would focus on anti-Semitism, calling on leaders of a liberal Jewish group, Bend the Arc, to attend and moderate the discussion. Levin had hoped the leftward tilt of the organization would make it easier to discuss such a sensitive topic with liberal members who sympathize with Palestinians. He also extended the invitation to freshmen allies of Omar and Tlaib — including Reps. Alexandria Ocasio-Cortez, N.Y., and Ayanna Pressley, Mass. — in hopes of making the two Muslim women more comfortable. But days before the meeting, Omar again sparked an uproar with her comments about American supporters of Israel. Several Jewish Democrats had quietly started pressing Pelosi to pass a resolution rebuking Omar by name and condemning anti-Semitism. Lowey used Twitter to "urge her to retract this statement and engage in further dialogue with the Jewish community," which in turn prompted a public retort from Ocasio-Cortez. "It's not OK," Hayes said this past week when asked about the specific exchange. "These [sorts of jokes] are off-limits. It's confusing for someone like me who is trying to learn." Hayes, however said, the meeting — which delved into the history of anti-Semitism and charged language — was helpful for people who don't know the meaning of certain words: "I'm looking to try to understand everybody's perspective," she said. "This isn't my community." The conversation took a different turn as some non-Jewish members in the room admitted they didn't know what anti-Semitism looks like. The Jews present appreciated the candor and sought to share stories illuminating why certain words had negative meaning. Soon lawmakers were talking about their own experiences with discrimination. Toward the end of the session, Phillips felt the need to bring up a personal hurt: Omar's recent comments. Omar, who supports a two-state solution to the Israeli-Palestinian conflict, said nothing as Tlaib described the effects Israel's policies on her Palestinian family. Others in the room saw racial undertones in Phillips's comments, offended that a wealthy white businessman representing an affluent suburban community was suggesting a black refugee such as Omar incited fear. Tlaib and Omar declined to comment about the meeting. Asked about the exchange, Phillips said he had not intended to offend anyone and had learned from it. "It wasn't planned, and it wasn't what we expected. But I think it was cathartic. It certainly was for me," Phillips said.